After seemingly endless hours of image editing, uploading, and wrestling with technology, I am relieved to announce that the Flickr Photostream is finally operational. That means that all of the best images from my recent trip to Germany are now online. You can view the photos by clicking the blue “More Photos” link at the bottom of the “Flickr Photos” box on the right side of the screen (it’s under the three photos; you might need to scroll down a bit). 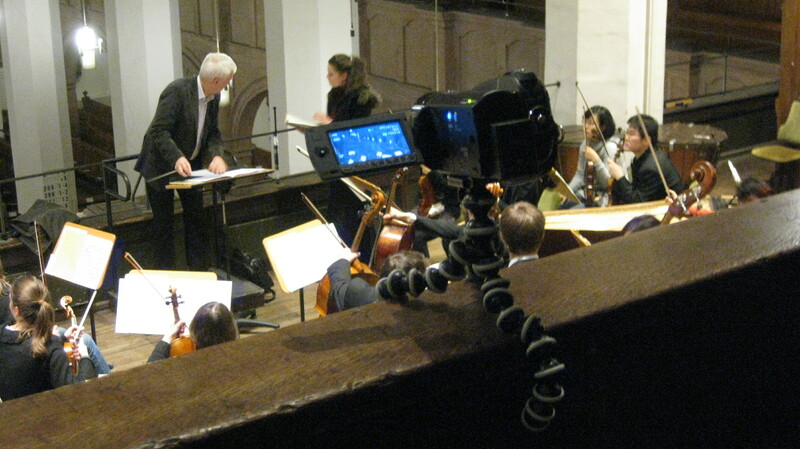 Now I can finally post this image from iPhoto to WordPress showing my trusty Gorillapod and camcorder hiding out in choir loft of the Thomaskirche. In doing all of this, I have also solved the image uploading problem I previously had with iPhoto and WordPress. As it turned out, the issue only concerned file management protocols on the Mac versus Windows. The image files in the iPhoto Library do not reside in regular folders as I was used to in Windows XP (and Vista). Instead, you have to find them in a different location when using the Upload/Insert feature in WordPress. Now, if you could care less about all of this geeky stuff, just go ahead and skip over the next paragraph. But if you’re interested, I offer the following advice as a public service and to help your hapless scribe remember what to do while traveling this summer. When uploading an image “from your computer” to WordPress from a Mac of recent vintage, you need to find the iPhoto Library from the “Media” category in the selection window. In other words, you’ll need to scroll down to the very bottom of the selection window categories on the left and pass by all of the other more reasonable places where a Windows user would search for files like “Documents” or “All Images.” The WordPress image selection window works like the Finder on the Mac: items are listed in categories, not as a general hierarchy of files. The categories are (from top to bottom): DEVICES, SHARED, PLACES (where most of the main folders are, including Documents and the Home folder), SEARCH FOR (ignore “All Images”), and then – dead last – is MEDIA. Under the Media Category are three subcategories: Music, Photos (yay! ), and Movies. Click on “Photos,” and you’ll be able to finally access the images in the iPhoto Library. What drove me crazy back in January was that the iPhoto Library would indeed show up in “Places” (under Home [or your name] > Pictures), but it was grayed-out and unavailable. I didn’t think to look down in “Media” because that was off my radar. But I was in an adventurous mood tonight and decided to look absolutely everywhere to solve this mystery once and for all. Whew! As a reward for reading this far here is a lovely image I just uploaded to make sure I described the uploading process correctly. It’s a close-up of the stained glass window in the Thomaskirche that honors J. S. Bach. 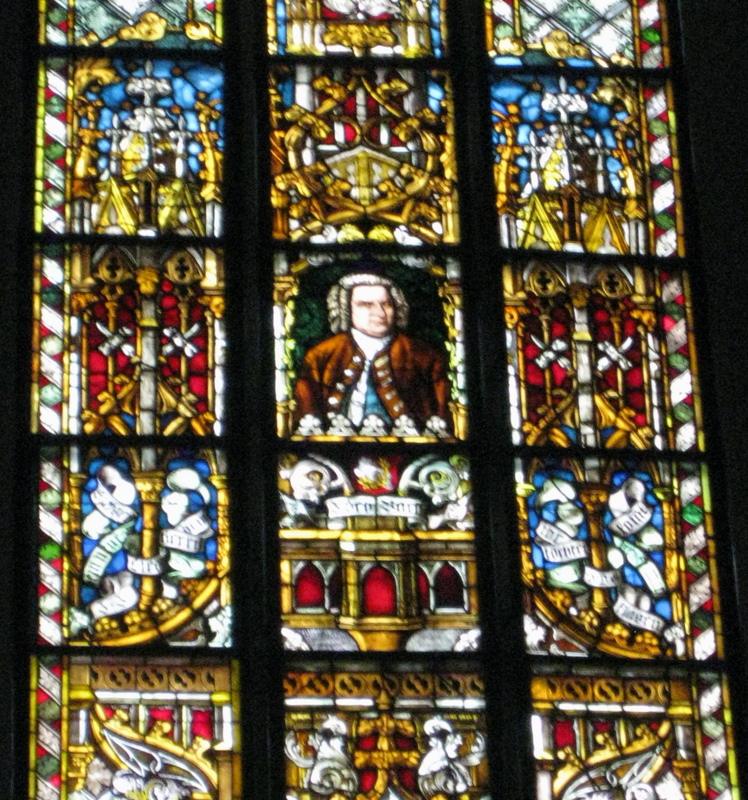 J. S. Bach has his own stained glass window in the Thomaskirche. Later this summer I plan to post more photos and videos from a trip to Northfield, Minnesota for the Vintage Band Festival where I will be performing with Newberry’s Victorian Cornet Band. It is such a relief to know that now I can finally post lots of photos to Flickr and upload images from the iPhoto Library to WordPress. Not bad for a day’s work! But in the meantime, I’m looking forward to conducting the final Frederick Symphony concert of the season this Saturday. It’s a Pops Concert with the theme “Shall We Dance.” Should be fun! I loved your band in 2006 and returned to Northfield this year. (My 85 year old brother plays trumpet with the 1st brigade band). I was watching closely in the Battle of the Bands and so enjoyed your band –watching the videos now-my favorite is the Nabucco Overture. Loved it!! Thank you very much for your kind words, Mary. I really appreciate it!